I mentioned Panagia Evangelistria in the text of Tinos town. Is it really so remarkable? Yes, actually it is. I believe that I never have experienced anything more extraordinary than Panagia Evangelistria. Maybe not the church itself, but everything that is happening around the church, it's almost like an art installation. A few decades into the 1800s a nun named Pelagia passed a farmer who was digging in a field. The nun had a vision that it nearby would be an icon and she asked the farmer to dig for it. The icon was indeed where the nun said it would be, it was completely undamaged and to show the icon respect, a church was built on the site as the icon was found. 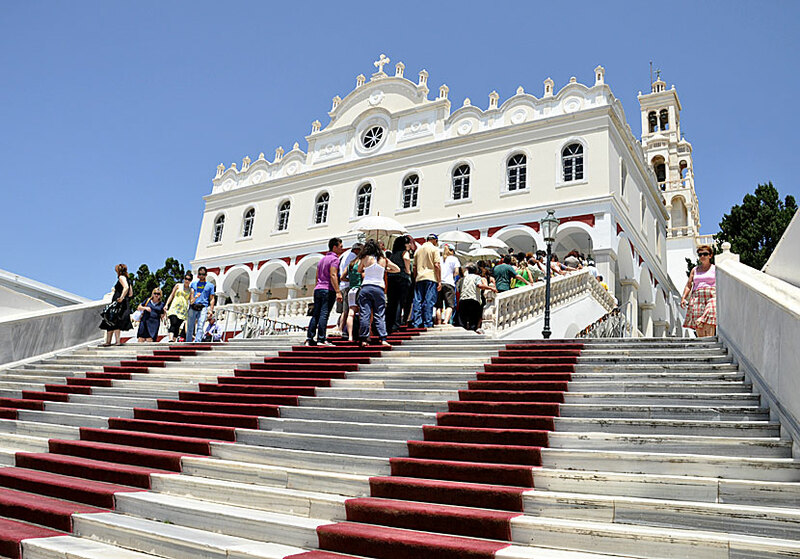 The stairs to Panagia Evangelistria. Panagia Evangelistria has ever since been the most important church in Greece and is visited each year by thousands and thousands of Greeks. You could say that Panagia Evangelistria is for the Greeks what Mecca is to Muslims. The icon is not only considered to have healing powers, it is also said that it can perform true miracles. Crawlers do not have to queue, they crawl between of those who queue. The true enthusiasts crawl all the way to the church. All the way to the icon. It is the crawling that makes Panagia Evangelistria such a strange attraction, the icon's power is believed to increase if you really make an effort to get there. And I find it hard to image that anything else can be more strenuous than to crawl up the long uphill slope and then up the stairs. Some of the crawlers are old, some is carrying heavy candles on their backs, and it's a mystery to me how they have the energy to crawl all the way up. But they struggle all theirs way slowly and with determination. Looking down in the ground and bathed in a sweat. You really hope that they get a reward. 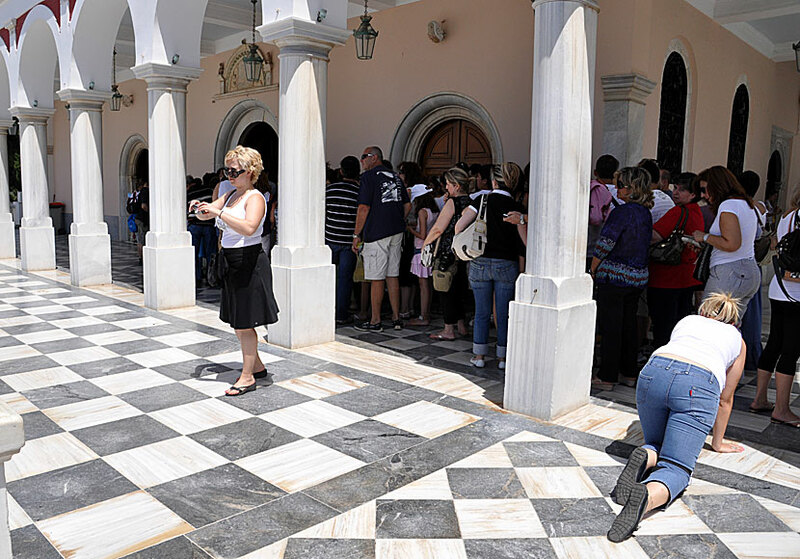 Thank God, you are just as welcome if you come walking on two legs: follow the red carpet through the beautiful gate and up the stairs, if you are lucky there is no queue, if you have bad luck you may be standing a long time - Greek queues are not exactly known to be democratic. The long slope up to the church. 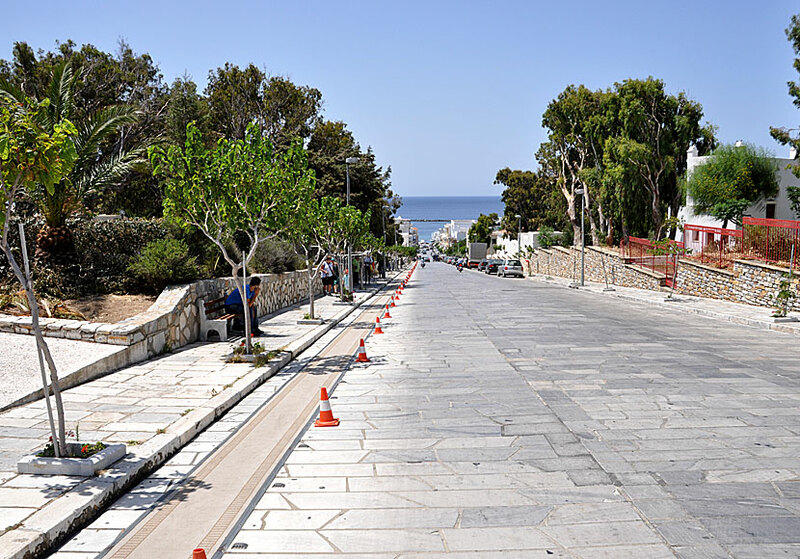 The slope begins at the harbor promenade in Tinos town. Crawlers do not have to queue (it would be strange otherwise), they crawl between the legs of those who queue up until they (finally!) reach their goal. 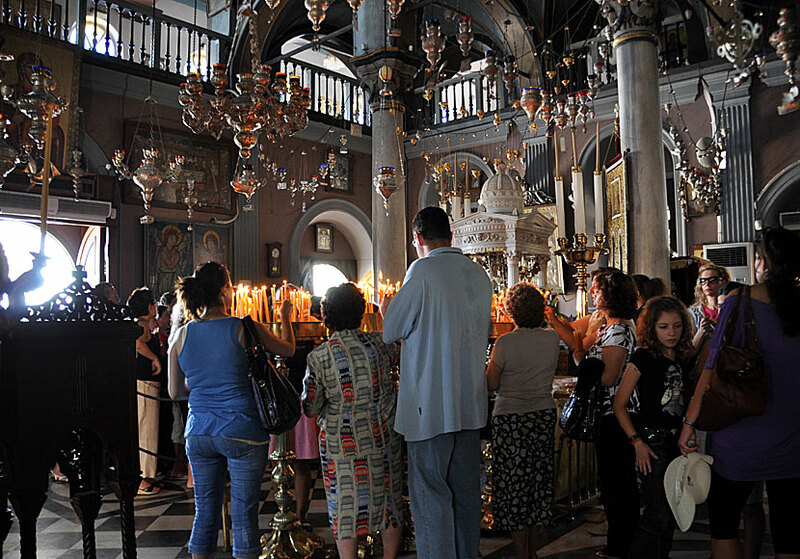 All visitors stop at the icon, do the sign of the cross and kiss the icon with dignity and then light candles. The church is richly decorated and beautiful in many ways, even an atheist get affected. An experience of great proportions. Some Greek friends to me, whose son was very sick as a child, visited the church every year to pray for a miracle so their son would recover. Which he also did after many years. I leave unsaid if it was the medicine science that healed him or if it was the icon. My friends, however, is convinced that the icon was the cause of their miracle. When I and Camilla were married on Santorini in the autumn of 2003, we visited the church to pray for good weather. It would be bad weather that day according to all the weather reports. But, believe it or not, we had the best imaginable weather during the wedding.